On a daring mission, search-and-rescue specialist Heidi Warren and her team step onto an icy Alaska mountaintop...and right into a trap. A stranded gang of thieves holds them at gunpoint, forcing them to serve as guides along the treacherous path. Menaced on all sides by dangerous weather, deadly terrain and murderous criminals, Heidi desperately needs someone to trust. But her rescue partner Isaiah Callahan is keeping secrets from her. Secrets that ended their chance at a relationship before it could even begin. Yet her survival depends on finding a way to trust Isaiah when a blizzard starts closing in and her options start running out. 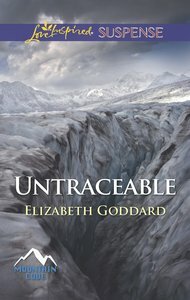 About "Untraceable (Mountain Cove) (Love Inspired Suspense Series)"